Showing in this year’s Summer Exhibition at the Royal Academy was a print from a wood-engraving by Derrick Harris. It sold on the first day; and additional prints have since been sold to a number of other buyers. But it was not designed as a picture to adorn the wall of an art connoisseur. It began life as a cover illustration for The Listener. The amiable, romantic figures of Derrick Harris have adorned the Folio Society’s Humphrey Clinker, rollicked through their Joseph Andrews, and embellished the Golden Cockerel production, Euphormio’s Satyricon. They have also illustrated Whitbread’s Encyclopaedia of Beer, and advertisements for Shippam’s meat pastes and Colman’s mustard. They inhabit a world peculiarly their creator’s. This workmanlike engraver whose name has been linked with artists such as Picasso and Matisse as an exponent – and a masterly one – of the contemporary faux-naïve, whose technique is manifestly modern, freely admits he is that unfashionable kind of being – an escapist. 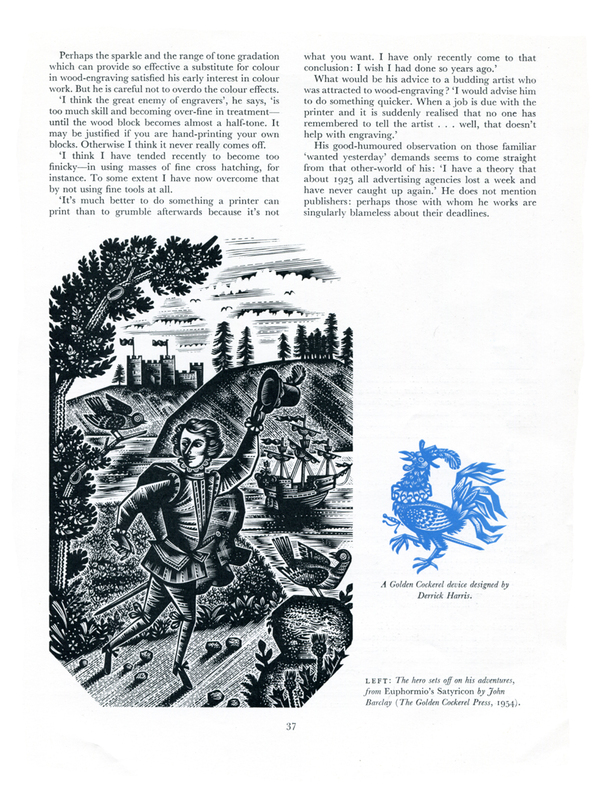 Like other contemporary wood-engravers, he has been influenced by Bewick and Eric Ravillious. And he learned a great deal from Noel Rooke and John Farleigh who were teaching at the Central School of Arts and Crafts while he was a student there. From the point of view of technique he has learned most from the work of John Buckland Wright, who exploited the decorative qualities of wood-engraving to the maximum. His greatest inspiration, however, has been the broadsheet and chap-book cuts of the eighteenth and early nineteenth centuries. His work shows some of their primitive quality and from their times it takes its authentic period detail. His choice of medium received a practical stimulus when he started doing the rounds of publishers and agencies with a portfolio of full colour drawings. Like many another aspiring artist, he could find no demand for costly-to-reproduce full colour work. 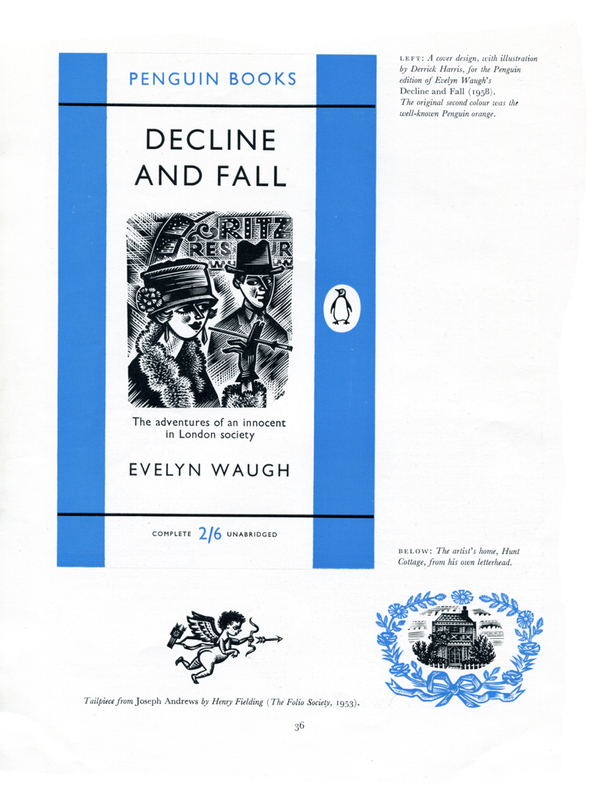 Black-and-white illustrations were what was wanted. Perhaps the sparkle and the range of tone graduation which can provide so effective a substitute for colour in wood-engraving satisfied his early interest in colour work. But he is careful not to overdo the colour effects. ‘I think the great enemy of engravers’, he says, ‘is too much skill and becoming over-fine in treatment – until the wood block becomes almost a half-tone. It may be justified if you are hand-printing your own blocks. Otherwise I think it never really comes off. ‘I think I have tended recently to become too finicky - in using masses of fine cross hatching, for instance. To some extent I have now overcome that by not using fine tools at all. His good-humoured observation on those familiar ‘wanted yesterday’ demands seems to come straight from that other-world of his: I have a theory that about 1925 all advertising agencies lost a week and have never caught up again.’ He does not mention publishers: perhaps those with whom he works are singularly blameless about their deadlines. Despite the practical shortcoming of being a slow process he is fascinated by the clarity and crispness of wood-engraving. Its characteristic hardness was the reason for its superseding his early interest in the softer medium of lithography. 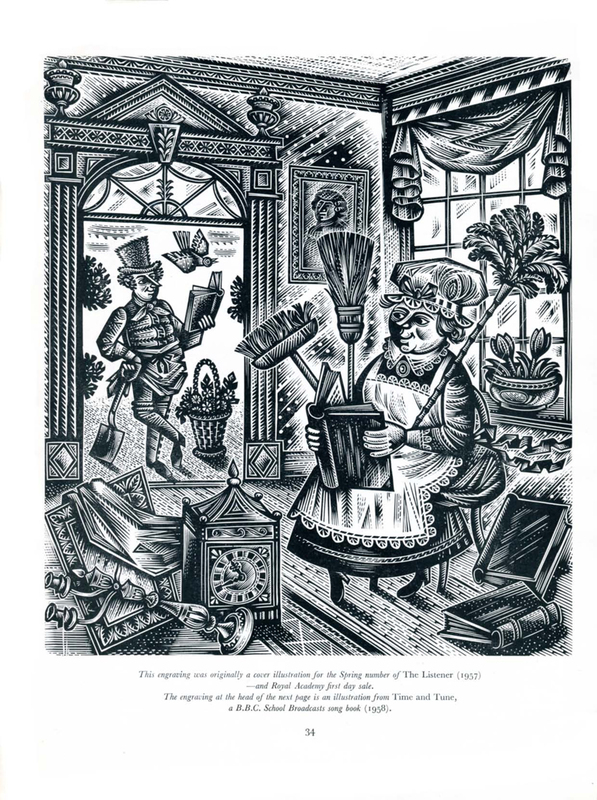 Wood-engraving, of course, like lithography, is an ideal method of book illustration, affording direct contact with the artist, without reproductive intervention. And to be a book illustrator was one of his earliest aims as an artist. His first job, while still a student, was to provide the illustrations-drawn, not engraved-for a children’s book. And - any publisher interested? - he still hankers after illustrating another, with engravings this time. 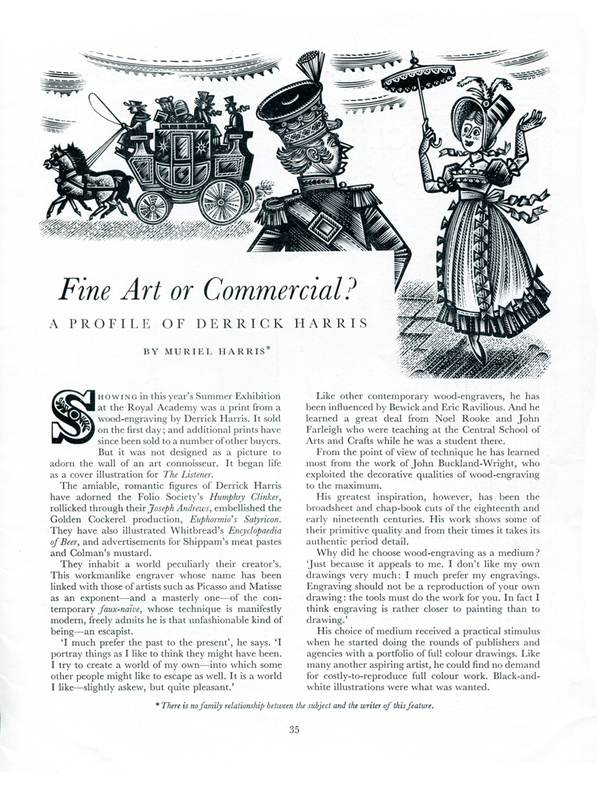 For as long as he can remember Derrick Harris has wanted to be an artist. He has been told that when he was very young he wanted to be a clergyman, but if that is so he has forgotten about it. Born at Chislehurst, Kent in 1919, he spent most of his childhood in Sussex. When he left Worthing High School, elderly relatives were very timid about his interest in art and assured him it would not earn him a living. So for a couple of years he studied architecture at the Art School in Worthing. He was a pacifist during the war. After working on the land in the early days he came to London in 1940, joined the London Civil Defence Service - and studied at the St. Martin’s School of Art. Both his parents had died shortly before war broke out. And now, with nobody else’s feelings to consider, and a small amount of family money, he made up his mind to try and fulfil his artistic ambitions. Also engaged on civil defence work in London during the early part of the war was John Farleigh. And when he went to Central School of Arts and Crafts on their return from evacuation in the Lake District, Derrick Harris went too. When the war in Europe ended he became a hospital porter. His hours were from 4 p.m. until midnight, and he was often so tired that he would fall asleep in the life class. It was at University College Hospital that he first met Mavis Flood, whom he married in 1946. Now fashion designer Mavis Harris, she was working there then as a nurse. On his release from war-time duties he immediately embarked on his career as a free-lance – with just £100 capital on which to live while he sought commissions. He has been concentrating on engraving since 1950. It was hard going, he recollects. ‘It is only in the past five years or so that I have been making ends meet. I was lucky to get a teaching job. It helped to pay the rent. In 1947 he started teaching one day a week at Kingston School of Art. Now he devotes three days a week to teaching – two at Kingston and one at Reigate School of Art, where he began in 1955. He firmly believes that the teaching of art students should be in the hands of practicing artists and enjoys the time he spends on it. The successful artist and teacher who was always bottom of his school art class is now a member of the Education Committee of the Society of the Society of Industrial Artists – but more interested in students than in Education with a capital ‘E’. And as Chairman of the Illustrators Group of the S.I.A. he is anticipating a visit to America soon with their exhibition which has been touring the country. He also sits on the Council of the Crafts centre of Great Britain and is a member of the Society of Wood Engravers, and of the Royal Society of Painter-Etchers and Engravers – to which wood-engravers have only been admitted in the past thirty years or so. For most of the nineteenth century wood-engraving had been used only as a method of reproduction: there were no creative artist engravers doing original work – only copyist engravers. It was still considered vulgar in 1912 when Noel Rooke first started a class at the Central School of Arts and Crafts. Now it has become respectable. In the ‘twenties and thirties was indeed primarily due to Noel Rooke and was always stronger in this country that elsewhere. Its major exponents, such as Gill and Farleigh, were his pupils. His more recent pupil, Derrick Harris, is interested in experimenting with wood-engraving for purposes other than prints or book illustration – such as wallpaper design, pottery transfers, decorative plastic table-tops. And he would like to try his hand at engraving on transparent plastic for lithographic printing. The artists will have to wait a bit longer. His only press at the moment is a small hand-press for proofing engravings in his studio on the first floor of the enchanting Regency cottage where he and his wife have lived for the past ten years. Hunt Cottage, in the Vale of Health, Hampstead Heath, is where Leigh Hunt came to live when he was released from gaol, after serving his sentence for libelling the Prince Regent. In the drawing-room here he introduced Keats to Shelley, who had visited him in prison. It was the first time the two poets had met. And in the same room he would put up Keats for a night on the sofa, when he had stayed too late for a return home after a day visit. Byron, too, was a visitor. Lord Northcliffe lived here as a child; and so did Ernest Rhys, who started the Everyman Library. Its present occupier has chosen an ideal atmosphere for the denizens of the world of fantasy. One can imagine them taking their ease in the historic drawing-room or sauntering down the garden path. Book illustration was, and remains, his first love. He feels strongly that books should be reviewed for the sake of their illustrations. But although the medium has the advantage of a greater permanency than others, he would not like to concentrate on it entirely. With Charles Rosner, he believes in the indivisibility of art. The distinction which is so often drawn between drawing and painting, between the fine arts and commercial art, he regards as an artificial one.